Please note that the content of this book primarily consists of articles available from Wikipedia or other free sources online. Bluemont is an unincorporated village in Loudoun County, Virginia located at the base of Snickers Gap in the Blue Ridge Mountain. At 680 feet, it is the highest community in Loudoun County. 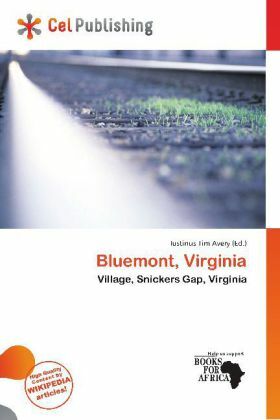 Originally named Snickersville, Bluemont changed its name to attract Washingtonians out to it when a predecessor of the Washington and Old Dominion Railroad was extended to the town from Round Hill. It is located on Virginia Route 7 just west of the incorporated town of Round Hill. Every fall it is home to the Bluemont Fair.